Gobliiins is the first game in the Gobliiins series. This game was the only game in the series to have a time limit for each puzzle. 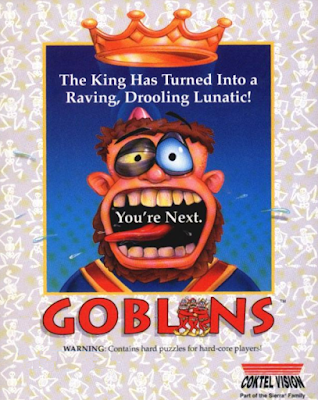 In this game you control three goblins, who each have a unique skill. In this game, a voodoo doll has caused King Angoulafre to go mad, so three goblins try to find Niak the Wizard, as he's the only one who can help the king. Gobliiins is now supported by ScummVM, a program designed to let 2D adventure games run on multiple platforms. With ScummVM, Gobliiins now runs on modern versions of windows, as well as Linux, Mac OS X, and many consoles such as Dreamcast, Wii, PlayStation 2, and PlayStation Portable. For a complete list of platforms supported by ScummVM, see here.